United Nations Environment Programme (UNEP) Chief Erik Solheim resigned from his post on 20th November 2018 following an audit report questioning his frequent flying (traveling) expenses. An audit carried by the UN's Office of Internal Oversight Services (OIOS) had found that Erik Solheim had spent about 5 lakhs US dollar (USD) on traveling abroad. These undue travel expenses raised accusations that Erik Solheim showed little regard for the environment and efforts to reduce carbon emissions generated by air travel. They come at a time when the world body is struggling with shrinking budgets. According to a draft of the report, the amount spent on travel by UN Environment doubled between 2014 and 2017. It was found to have traveled for 529 out of the 668 days audited, spending $488,518 with no regard for the rules. 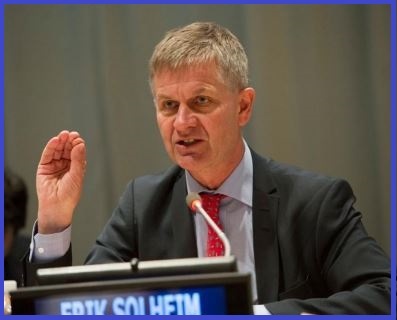 Erik Solheim's resignation accepted by UN Secretary-General Antonio Guterres would be effective from 22nd November 2018. Erik Solheim is a Norwegian diplomat, who served as the Executive Director of the United Nations Environment Programme from 2016 to 2018. He was earlier a politician for the Socialist Left Party (SV). Erik Solheim led its youth branch, the Socialist Youth, from 1977 to 1981 and was the party secretary from 1981 to 1985. He served as a member of the Parliament of Norway from 1989 to 2001. He was appointed Executive Director of the United Nations Environment Programme in 2016.